Will is thirty-six but acts like a teenager. He reads the right magazines, goes to the right clubs and knows which trainers to wear. He also discovered a great way to score with women - at single parents' groups, full of available mothers, all waiting for Mr Nice. That's where he meets Marcus, the oldest twelve-year-old in the world. Marcus is a bit strange: he listens to Mozart, looks after his mum and he's never even owned a pair of trainers. Perhaps if Will can teach Marcus how to be a kid, Marcus can help Will grow up. 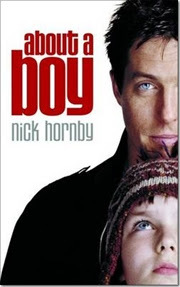 About a Boy was written in 1998, and takes place in 1993-94. It is one of my favourite books of all time, and I have reread it several times since I first read it at age 17 or so back in 2005. I want to use a lot of big shiny clever words to describe this book, but my mind is failing me. The story contains psychology, sociology, a time period's culture, and some of the most well written characters I've ever encountered all wrapped up into a brilliant story. It has some of the most accurate and entertaining comments on human behaviour and it contains the best humour style in the world: the British. Will is immensely shallow and all about himself and desperately trying to avoid facing real life, while Marcus is utterly clueless but still knows he has to take action before bad things happen, again. Following their lives, their achievements and their growing friendship has once again been one of my favourite reads and I heartily recommend it. I love Nick Hornby. I've not read anything of his that I didn't enjoy. I think "High Fidelity" is probably my favourite. I always wanted to watch this movie!! THanks for reminding me!! Hop over to my blog to enter in a great giveaway!! I'm a new follower!! @Universe in Words - my pleasure :p Following you back! New follower! Stop by and say hi if you get a chance-and check out my giveaway! I have this video in my to-watch-list (is there such a thing, I think video buffs should unite and develop these kinds of jargon as well), and I didn't realize it was by Nick Hornby! Another member from the GatheringBooks team has spoken about Hornby, and she did say that SLAM was a good read. Hmm.. I should check out more Nick Hornby titles here, and start reading him soon.